Palestinian political parties have agreed to hold general elections by the end of next year. The announcement was made in Cairo where the groups have been holding two days of closed door talks. It comes a month after the two leading Palestinian factions, Hamas and Fatah, signed a landmark deal to end their decade-long rift. 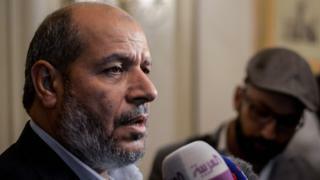 A statement said the date of the election should be left to Palestinian President Mahmoud Abbas to decide. "A date has been agreed to hold presidential and legislative parliamentary elections, as well as elections for the Palestinian National Council, no later than the end of 2018," Mustafa Barghouti, general secretary of the Palestinian National Initiative party, said. He said the central electoral commission would now start its preparation for elections, and expected to set the precise date in February at another meeting of the factions. The deal agreed in Cairo last month sees Hamas hand administrative control of the Gaza Strip to a Fatah-backed unity government by the end of this month. But there has been friction between Hamas and Fatah beneath the surface at the latest talks in Cairo, with mutual unofficial accusations of bad faith, says the BBC's Arab Affairs Editor Sebastian Usher. There have been no elections to the Palestinian legislative body since the 2006 election.